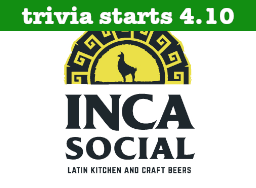 Inca Social is the newest place to play District Trivia in Vienna. Grab your friends and qualify for the $5000 Tournament of Champions on Wednesday nights at 7:30 pm. We will see you there!